Your patients may not know the difference between a routine cleaning and periodic periodontal maintenance. Use this ADA-published brochure to explain why regular, professional treatment is important in controlling periodontal disease. 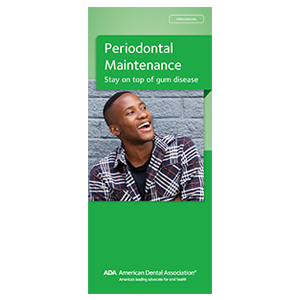 For patients at risk for periodontal disease, or recovering from it, this brochure can support your professional recommendations and provide at-home maintenance tips. This easy-to-read pamphlet teaches patients about reducing bacteria to help periodontal pockets shrink, and how it relates to their overall health. When you send your patient home with this Periodontal Maintenance brochure, you’re giving them the knowledge they need to prevent an onset of periodontal disease. Order your copies of Periodontal Maintenance: Stay Ahead of Gum Disease today!